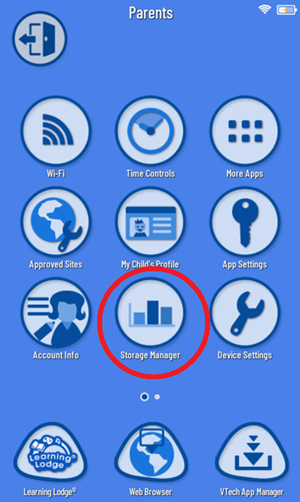 Unfortunately, there is not one single place where you can manage your device's memory storage. You will have to use different methods to manage the storage of different types of content. This tutorial will give you tips for managing your device's memory. 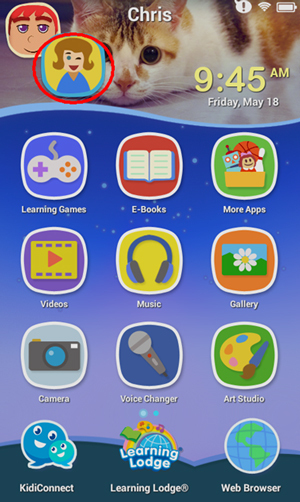 Use the VTech App Manager to manage games, e-Books, videos, and music downloaded from Learning Lodge®. 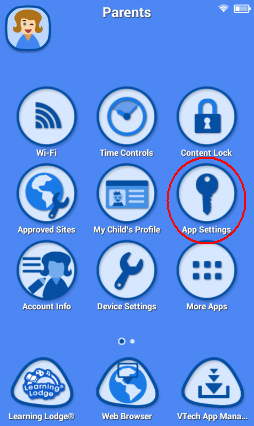 To access the VTech App Manager, touch the avatar in the upper left corner of your child's Home screen, then touch the Parents icon to enter Parent Settings. Touch one of the icons at the top to select the content type. To delete an app, touch the trash can next to it. We keep a record of any apps you purchased from Learning Lodge®, so if you change your mind you can download the app again later. 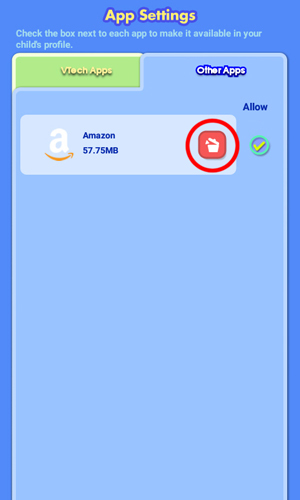 Use App Settings to manage content downloaded from the Amazon Appstore. You can find App Settings in the Parent Settings menu. Select the "Other Apps" tab to see content downloaded from the Amazon Appstore. Touch the trash can icon next to an app to delete it. 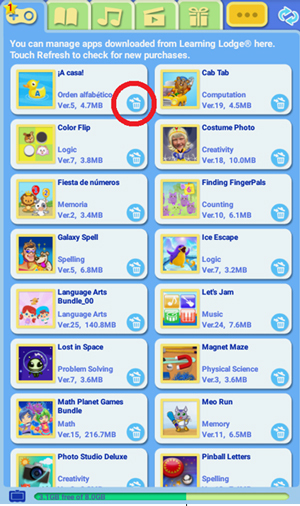 You can also use App Settings to delete games dowloaded from Learning Lodge® by selecting the "VTech Apps" tab. Pictures and videos you've taken with the camera can be deleted directly within the Gallery. 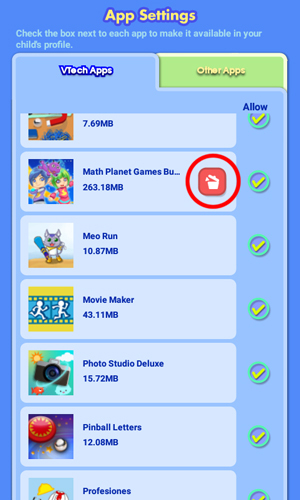 But the easiest way to free up memory used on pictures or videos is to connect your KidiBuzz™ to a computer and transfer the files. If you need help transferring files, see the tutorial How do I transfer files from my KidiBuzz™ to a computer? You can use a microSD card to provide more storage for photos, videos, and music. Once you insert a microSD card, by default these types of media will be saved on the card. 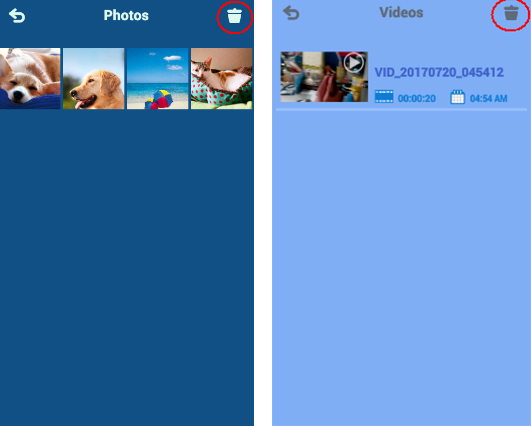 If you had previously saved a lot of photos, videos, and music in your internal storage, you will still need to transfer the older files to the microSD card manually and then delete those files to free up space.